We provide coal handling service for our customers on affordable prices with reliability as per there needs, no matter even if its liasoning or bidding, transportation or handling, screening or purchasing. We are the one stop shop for all. - Annual Maintenance Contract, including House keeping jobs of Coal Handling Plant of 3 x 212 MW Capacity Bokaro ’B Thermal Power Station. Damodar Valley Corporation, Bokaro B Thermal Power Station, Bokaro Thermal, Bokaro, Jharkhand. With our expertise in this domain, we are offering Coal Handling Services. These services are extensively used for transferring coal from trucks, wagons and triple hoppers in coal handling plants. All these substances are transferred to the boiler with the help of bucket elevators and belt conveyors. We execute our services on-time and as per the requirements of the clients. With our experience and technical designs we can execute all projects from concept to commissioning. Our engineering department can undertake the complete layout preparations, equipment selection, General Arrangement drawings and Detail drawings for Mechanical, Electricals, Structural and Civil work. Krishnapatnam Port is Equipped with the best facilities to handle coal cargo. 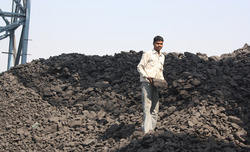 All types and grades of coal including steam coal, imported coking coal & thermal coal, sourced from domestic sources. After over eight decades of working in the business, we are able to provide the entire gamut of services that may be required by a consumer. With a proper knowledge of the coalfields, railways and government policy we have consistently been able to deliver the maximum benefits to our customers. Energo is a leading Coal Handling Plant EPC contractor with a total experience of over 20, 000 MW Capacity. Erection commissioning services in Power Plants (Thermal) in following areas: - ... BACS leveraging our capabilities in coal handling and ash handling and our ... project operations for ensuring timelycompletion of Commissioning activities. Energo is a leading Coal Handling Plant EPC contractor with a total experience of over 20, 000 MW Capacity.Energo also supplies huge range of equipments such as Stacker Reclaimers, Wagon Tipplers, Paddle Feeder, Travelling Tripper, Hydraulic Lump Breaker, all types of conveyors, Pulleys & Idlers, Gates, apron feeders, etc.